RoCkaNdFRoCk: MiSSioN iMPoSSiBLe: CéLiNe TRaPeZe!!!!!!! it's amaaaaazing!! !want all celine bags!but it's so expensive! Sono troppo controcorrente se dico che mi piace di piu' il design della Trapeze rispetto alla Boston? La trovo piu' elegante però ovviamente è una mia opinione :)Buona scelta! this looks like a nice quality too :-D and well maybe you really will win the lottery - good luck! I loved the bag, unique design! Have a great week early!! Oh I understand you dear :) I have the same obssesion for the Chanel 2.55 :P And the bag in the photo is great!!! questa borsa è davvero adorabile! Following you now! See you soon! I LOVE THIS BAG!!! You look nice!!! Now I´m following you!! LOVE that bag! Hope you get it! Really wonderful, like all of the brand but it's true ... we can not have everyone. Ma ce la farai cara! Baci! ps. Join my giveaway and win the most beautiful sapphire necklace! 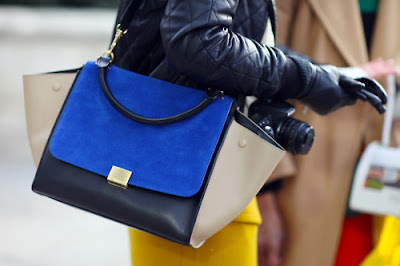 I love too Celine bags and i want so badly one of them:)Great blog. That is one gorgeous bag! Great blog! Your blog is so colourful!! I love it, but above all it's different! Thank you for your comment, I'm following you!! Beh, che dire? Questa borsa di Celine è uno dei miei oggetti del desiderio! Grazie per il following! Ti seguirò anche su Bloglovin! Poi un giorno mi dirai il tuo segreto per avere così tanti followers!!! this is my dream bag. i'm actually thinking of selling one of my chanel bags to get my hands on this one. :) great choice! And as you said, nothing it's impossible! Spero che il dio dei saldi...venga in mio soccorso!!! Ti facilito la scelta: da Celine le borse non vanno in saldo ahimè'...baci!